GLASGOW will host an all-Yorkshire clash in round three of the Dafabet Scottish Open after snooker stars Peter Lines and Ashley Hugill both won on day three. Experienced Leeds pro Peter Lines will take on 23-year-old Ashley Hugill in Glasgow’s Emirates Arena after Lines defeated Kurt Dunham 4-2 and Hugill remarkably downed world No.13 Ali Carter. York potter Hugill beat Carter 4-3 to upset the odds, and Lines is targeting an improved performance after being less than satisfied with his second-round play. “I’m still here that’s about all I can say – that was horrendous!” said Lines. “We (himself and Dunham) both played so bad, my lad was watching and he played so well yesterday against Robert Milkins and got beat, he must’ve been wondering how one of us two can get through to the next round. “Honestly we both played terrible and the worse he played that made me worse and vice versa. Lines was joined in the next round by another Leeds potter, David Grace producing an impressive 4-3 win over Alan McManus. Scot John Higgins made breaks of 144, 138 and 108 in beating Doncaster’s Christopher Keogan 4-1 while defending champion Marco Fu beat China’s Fang Xiongman 4-2. Elsewhere, Ronnie O’Sullivan progressed to the third round of the Scottish Open with victory over Robert Milkins. O’Sullivan, who won his sixth UK Championship last Sunday, made century breaks of 112 and 101 on his way to beating Milkins 4-1. The five-time world champion will next play Li Hang, who beat Jamie Curtis-Barrett 4-1. 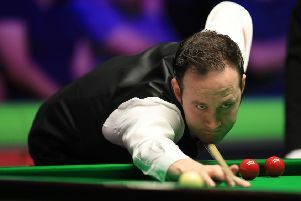 Daniel Wells, who defeated Shaun Murphy in the first round, ousted another big name in Jimmy White with a 4-1 win. His best break was 103 in the second frame. Neil Robertson, the 2010 world champion, beat Liam Highfield 4-2, with a best break of 138 in the opening frame.